(NC) — Burglary can leave families feeling vulnerable and violated. According to security experts, by far, the most common threat to our home while we are back at work and school is burglary. Patrice De Luca, V.P. 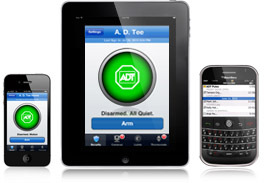 of Customer Care for ADT Canada says the first step in burglary prevention is gaining an understanding of who commits these crimes and why. Most home burglars are young males looking for things that are small, expensive, and can easily be converted to cash. Items like cash, jewelry, guns, watches, laptop computers, and other small electronic devices are high on the list. Quick cash is needed for living expenses and drugs. Although home burglaries may seem random in occurrence, they actually involve a careful selection process. What follows is a list of suggestions from ADT, providing Protectron’s line of products, to minimize your risk by making your home unattractive to potential burglars. • The first step, according to De Luca, is to “harden the target” or make your home more difficult to enter. “Remember burglars will simply bypass your home if it requires too much effort or requires more skill and tools than they possess,” he says. Most burglars enter via the front, back, or garage doors. Burglars know to look inside your car for keys and other valuables so keep it locked, even inside your garage. Use high quality Grade-1 or Grade-2 locks on exterior doors to resist twisting, prying, and lock-picking attempts. • When on a long-term business trip, leave a car in your driveway or arrange for a neighbor to keep a car there and move it around from time to time. Have someone mow your lawn, rake leaves, or shovel snow and pick up your mail while you’re away. • Home security systems play a crucial role in a home security plan and are very effective, if used properly, especially when monitored 24-7 by ULC-listed monitoring centres. De Luca cautions that home security systems need to be properly installed and maintained to be most effective. He recommends your home security system include a loud inside alarm, detectors at all exterior doors, and motion sensors in the master bedroom and main living areas. • For ultimate control and peace of mind while you’re at work, he recommends you look into the new fully interactive wireless security systems where you can arm and disarm your alarm, lock or unlock your front door, control lights and your home’s thermostat at the touch of your smartphone. You can even include interior and exterior cameras with interactive surveillance that enables parents to receive alerts to view the comings and goings of their children from school or cleaning staff in video or image format on their work computer or smartphone. Contact Us for more information in getting your $99 premium installation – an $850 value, plus order now and get a FREE Wireless Remote – “Keyfob”. See the premium security system here. Previous Closed Circuit TV Systems.